The country’s birth rate fell below 11 for every 1,000 people, its lowest level since the People’s Republic started in 1949. It’s a reminder that the country’s working-age population will keep shrinking, and makes redesigning a weak pension system a far more pressing matter. 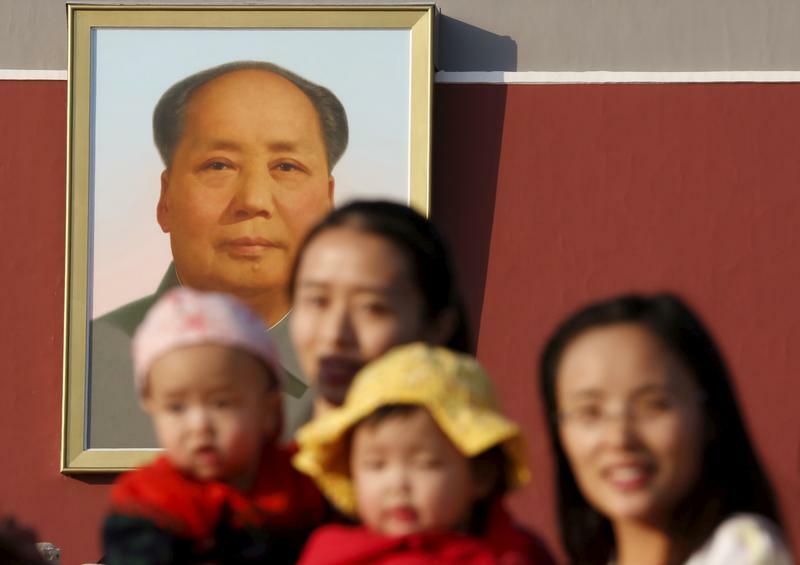 Two women and their babies pose for photographs in front of the giant portrait of late Chinese chairman Mao Zedong on the Tiananmen Gate in Beijing November 2, 2015. China must continue to enforce its one-child policy until new rules allowing all couples to have two children go into effect, the top family planning body said. The ruling Communist Party said last week that Beijing would loosen its decades-old one-child policy. The plan for the change must be approved by the rubber-stamp parliament during its annual session in March. China’s birth rate fell to about 10.9 per thousand people in 2018, the National Bureau of Statistics reported on Jan. 21. The figure declined from 12.4 in 2017 to reach the lowest level since the founding of the People’s Republic of China in 1949, according to Reuters. The central government in 2016 allowed couples in urban areas to have two children, replacing the so-called one-child policy that had been in force since 1979.